The West Berkeley business makes a convincing leap from catering to brick-and-mortar neighborhood gem. The K.F.C. 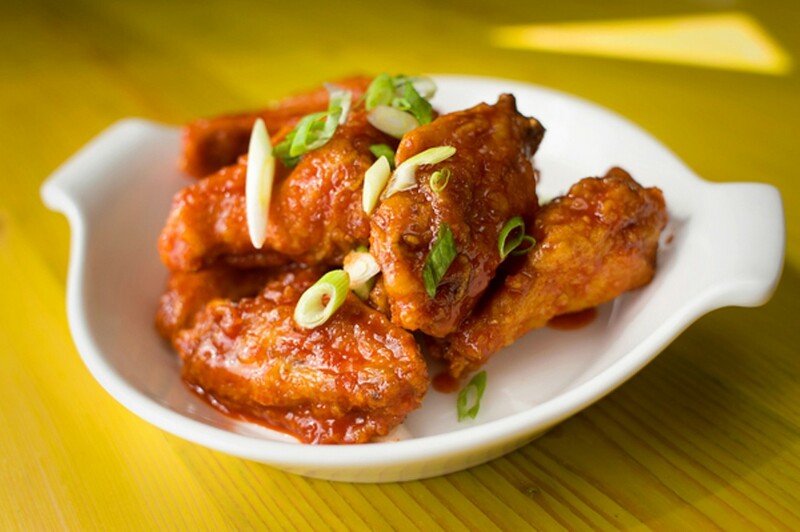 Wings may be the best Korean fried chicken in the Bay Area. Hours: Wed.-Mon 5:30 p.m.-10 p.m., Sat.-Sun. 10 a.m.- 2 p.m. When a caterer attempts the vast leap from boxed lunches to bona fide sit-down restaurant, you might expect a quaint little hole-in-the-wall with Xeroxed menus and a tiny, cobbled-together staff — a place long on charm and short on refinement. That's not at all the scene at Stella Nonna, which opened in West Berkeley in late May. For starters, it's an awfully handsome restaurant: lovely exposed wood beams, long rectangular skylights, one of those pull-up garage-door "windows" that are all the rage now, and the earth tones and indigos of a particularly well-appointed Southwestern log cabin. And, though it's a casual restaurant, there is a kind of polish to the Stella Nonna dining experience. A hostess greets you warmly at the door, and a black-clad waitress dutifully recites the day's specials. The service, in general, is notably friendly and attentive — workaday trappings of a sit-down dinner, but ones often absent at the East Bay's hipper new eateries, presented here without the awkward missteps you often get from first-time restaurateurs just one month on the job. I dug the vibe. The food, too, defies expectations. The restaurant's name is Italian for "star grandmother," and, according to chef and co-owner Tim Carlon, that isn't just shtick: Both he and fellow co-owner (and front-of-house maven) Sarah Nasgovitz learned to cook from their grandmothers. But you'd be remiss if you ate here expecting mostly Italian grandma food — lasagnas, minestrones, and such. Instead, Carlon has called on a variety of regional and international influences — including New Orleans, Latin America, and the Middle East — to create a menu that feels surprisingly modern for a place specializing in "grandma food." It's arguably the best of the recent crop of East Bay restaurants focused on eclectic, globally inspired comfort food. The complimentary house-baked focaccia bread — long, pillowy-soft sticks that come to the table warm — is absolutely worth requesting. And the meatballs in the mini meatball heroes are plump, luscious, and notably airy specimens that would be very much at home atop a platter of Grandma's red-sauce spaghetti. But would you believe it if I told you that some of the best Korean fried chicken I've eaten in the Bay Area is served at this decidedly non-Korean restaurant, run by a couple of white Midwesterners, and not some spot on Oakland's much-vaunted kimchi row? 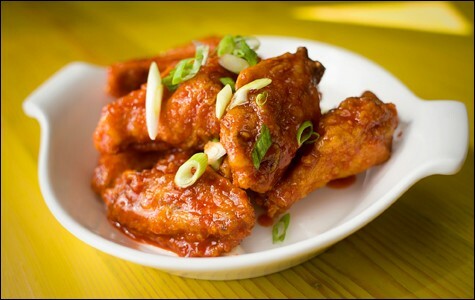 The savory gochujang (Korean red pepper paste)-based sauce on Carlon's Korean-fried chicken wings was highly addictive, even if it was only a little bit spicy, like a mild Sriracha. The key to the dish is the double-frying technique that Koreans have long sworn by — an initial dip in the fryer cooks the chicken through until the meat is tender; the second, at high heat just before serving, renders the remaining fat and yields well-blistered, shatteringly crisp skin that isn't the least bit greasy. I'd never have predicted it, but Stella Nonna's wings boast the crispiest skin I've encountered in the East Bay. No one would blame you if you got a double order and called it dinner. On the other end of the fried-chicken spectrum is the "Minnesota Fried Chicken," which is named after Carlon's home state even though the recipe comes straight out of the South — a crunchy-battered, well-seasoned rendition that I liked well enough, though the nitpicker in me wished for at least one piece of dark meat instead of the wing and breast I was served. In any case, the best parts of the plate were the sides: tender bacon-braised greens and a bed of creamy, garlicky Florida butter beans (a wide, flat lima bean varietal, notable for being not too starchy, from the heirloom bean specialist Rancho Gordo). Probably the weirdest entrée was the Hampshire pork carnitas (named for the breed of pig, not the English county or New England state), which was made up the following components: citrus-braised pork shoulder served next to a chile relleño stuffed with mac 'n' cheese (! ), both of which sat in a pool of ancho chile sauce, with a couple of long "ears" of sweet cornbread on the side. Carlon aptly described the dish as "a potluck on a plate" and said it was inspired by his friend's Yucatecan grandmother's carnitas recipe. It's a random dish, but somehow the flavors worked together, though I found the pork to be a bit too lean and dry and wished the cornbread had been served warm. Even a tried-and-true salad of beets and goat cheese had the added pizzazz of deep-fried bacon batons (like fancy Bacon Bits) and toasted pistachios. And, although Stella Nonna isn't an Italian restaurant, there were a couple of pasta dishes on the menu, including house-made pappardelle with a meatless, but satisfyingly meaty, porcini mushroom sauce studded with caramelized onions — the sauce an invention of yet another friend's grandmother, Carlon said. And the lamb bolognese penne was notable for its light and refreshing quality, thanks to the addition of charred and shredded mint leaves and a big dollop of fresh ricotta cheese. The dessert menu, on the other hand, sticks to good old Americana: brownies, root beer floats, rhubarb crisps, and thick wedges of cake — fudgy chocolate cake and carrot cake with cream cheese frosting (a dense, suitably comforting version, if a bit pricey at $8 a slice). It turns out that the restaurant has been at least ten years in the making. Carlon and Nasgovitz said they never intended to limit themselves to corporate luncheons when they launched their catering business (also called Stella Nonna) in the late Nineties. But, though a brick-and-mortar spot was always in the cards, their plans were waylaid by duplicitous would-be landlords and assorted false starts until the restaurant's current location — previously occupied by the outdoor-gear outlet Wilderness Exchange — became available. I, for one, am happy that they waited to do it right. The building that once housed bikes is now home to fried gnudi, grilled squid, pizzas, pastas, and more.